I had planned to take the Hedman-Atlas bus from Copan Ruinas, Honduras to Antigua, Guatemala ($43). Their busses are so comfortable and fabulously safe. In Copan though, I kept seeing signs for the $20 van (micro-bus) and was told they were safe and didn’t stop to pick up other passengers so baggage was safe lashed to the top of the bus or inside. So, I decided to book a seat on the van. When I went to book my seat at the place Lonely Planet recommends, where many of the travelers hang out, Via Via or something like that, the girl told me it wouldn’t go without two people. That remained their story for the days I was in Copan. After a couple of days I inquired across the street at another place that did van bookings, Don Moises Guest House, a father-son business. There, the father called the van company and the son explained to me that the van has to go even with no passengers. I booked at 3:20 thinking it might be odd to be the only one on the van for hours, but ok. The next day I arrived to the van and found it was filled to its 14 person capacity and that a group of girls had been turned away by 9pm as the van had filled soon after 7pm. The stops were well timed. We stopped at a Texaco station that could have been anywhere in the US. 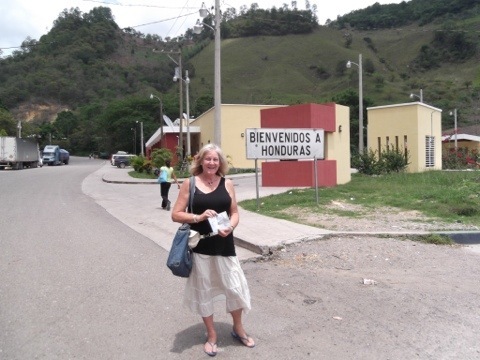 Me at the border after exiting Honduras. 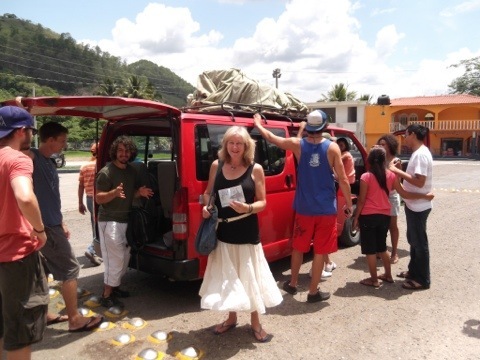 My van-mates and I a few minutes later after entering Guatemala.